Jazz is alive and in constant but very creative change. 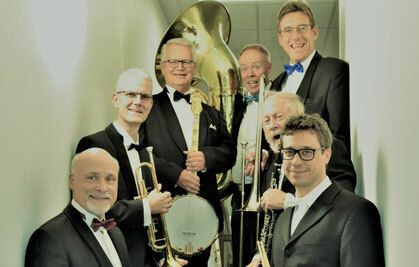 Whoever has experienced the JAZZ LIPS in concert, appreciated the broad musical range of Hot Jazz, Blues, Funky Brass Band und Caribbean Style. This is the exact opposite of stuffy straightness, of stylistic boredom or unvarying routine. Nevertheless are they guided by past masters as Armstrong, Bechet, Ellington as well by the contemporary New Orleans style. The traditional Hot Jazz of the 20s / 30s is and has been the inspiring example for the musicians over the years, but cover versions of pop music and self-composed titles are included. There are more than enough ideas to play with. This music always sparks ! The musicians with their quality on their instruments and experience of jazz history never left any doubt about the warmfelt love for this music style. But most of all they want to entertain their audience ! Who is acquainted with the JAZZ LIPS, is definitely aware of the wild times in the seventies in Hamburg, of the successful and eventful 48 years band history with countless concerts from Ascona to Copenhagen, TV performances, of now 12 LP`s / CD`s and all the great musicians who have joined the band over the years and have left their footprints. Especially the founder and face of the band Peter "Banjo" Meyer. But this website is now featuring the JAZZ LIPS of today. We hope you can find some joy by browsing this website with audio/video snippets !